Heat oven to 350°F (325°F for dark or nonstick pan). Spray bottom and sides of 15x10x1-inch pan with baking spray with flour. Make cake batter as directed on box using cake mix, water, oil and eggs. Pour batter into pan. Bake 17 to 23 minutes (19 to 26 minutes for dark or nonstick pan) or until toothpick inserted in center comes out clean. Cool in pan on cooling rack 30 minutes. In small microwavable bowl, microwave peanut butter uncovered on High 20 seconds or until softened and spreadable. Drop by teaspoonfuls onto surface of warm cake; spread carefully to cover top. Refrigerate cake to harden the peanut butter, about 15 minutes. Meanwhile, in medium microwavable bowl, microwave chocolate chips and butter uncovered on High 30 seconds. Stir; continue to microwave on High 10 to 20 seconds longer, stirring after 10 seconds until chips are melted. Stir in frosting. 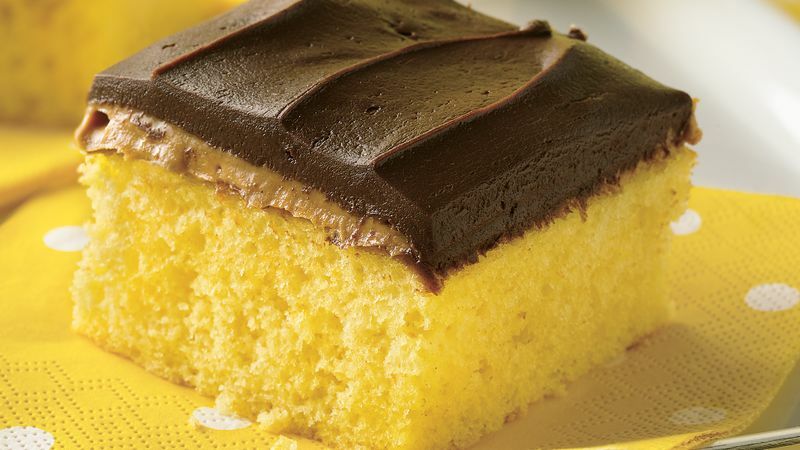 Spread frosting over peanut butter layer on cake. Store loosely covered. This is our version of a "Tandy Kake," a white cake made with peanut butter and chocolate that was popular in the 1930s. For a flavor reminiscent of a popular candy bar, substitute milk chocolate chips for the semisweet.